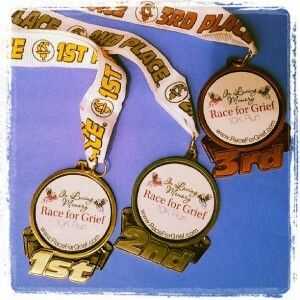 Come join us to honor your loved ones on Memorial Day at the Race For Grief event. 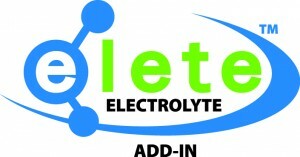 A 10K run (6.2 miles), 5K run (3.1 miles), 2 mile walk & Kids K (non-timed) will be offered. 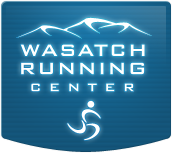 The races will begin at 8 a.m. from West Bountiful Park. The walk starts at 8:05 and the Kids K will start at 10:15 a.m.
We would like to grow the numbers for this event and are looking for Ambassadors. If you would like to spread the word about this event please message Coach Lora Erickson “Blonde Runner” at theblonderunner@gmail.com There are some great perks. “I just wanted to say ‘thank you’ for putting on this event. I enjoyed my experience completing my first 10k. What I really enjoyed is running for the cause. This event was a great way to gather a group of people together who share a common thread, of pregnancy or infant loss. I lost my first son seven years ago, running and training to complete this 10K has helped me even now in my healing – including my sense of getting stronger in mind and body. I not only completed this goal for him, I did it for my other three amazing children as well. I have marked this event on my calendar for next year!” ~ Erin R.
Many years ago I lost a little baby girl named Samantha. She lived only five hours. Click here to read the complete story. It was a difficult time for me and my husband. I know the struggles faced with a loss and how difficult it can be. I wanted to do something to honor her and bring community members together to help others through the grieving process (a life-long journey I believe) so I have organized the Race For Grief event. All those that have ever lost someone; a husband, wife, parent, sister or brother, friend, baby, miscarriage, grandparent etc are welcome to participate in the memory of their loved one. When you have lost someone, you never forget them. This is a day to honor their memory and come together to celebrate their life. The event will also raise funds to support local grieving programs like Caring Connections, The Sharing Place & Utah SHARE. Come join us or support a friend or family member that has lost someone. This may mean more to them than you know. All participants are encouraged to make a bring a poster about your loved one to display at the event and a pinwheel to line the finish. Thank you to all those that attend and support this event. It means so much to our family! GET REGISTERED: On-line registration is now available through active.com. Participants are encourage to put together and bring a poster in remembrance of their loved one to be displayed at the event (with their name, a picture or whatever you’d like). Many groups have also make shirts in memory of their loved one to run/walk in. This race will be capped at 500. Note: Prices go up Jan. 1, March 15 & 5/7. No shirt guarantee after 5/14. After the 10K/5K race – awards at the park covered pavilion (approx. 9:30/10a.m.). Random prizes given through out the event. Listen for your name. Registered participants will be automatically entered. DIRECTIONS TO THE PARK: West Bountiful Park, 550 West Pages Lane (1600 North), West Bountiful Utah. The park is just west of I-15 From the North (Layton/Ogden) From the South (Salt Lake City) 2013 results VOLUNTEER We could always use a helping hand. If you would like to volunteer to help, please send a message to theblonderunner@gmail.com and we will put you to work. This event is put on in memory of a little girl I lost – Samantha. It is not meant to be a sad event but rather a celebration of their lives and a day to honor and remember them. 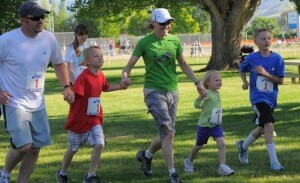 The West Bountiful Park venue welcomes families with playground equipment and lots of grass and covered pavilion. 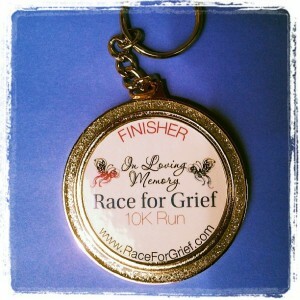 Blank “In Loving Memory…” bibs will also be available at the registration table to fill in with a name of your loved one and pin to your back to take them on your event journey with you. We also encourage all participants to make and bring a poster about your loved one to display at the event and a pinwheel to line the finish. 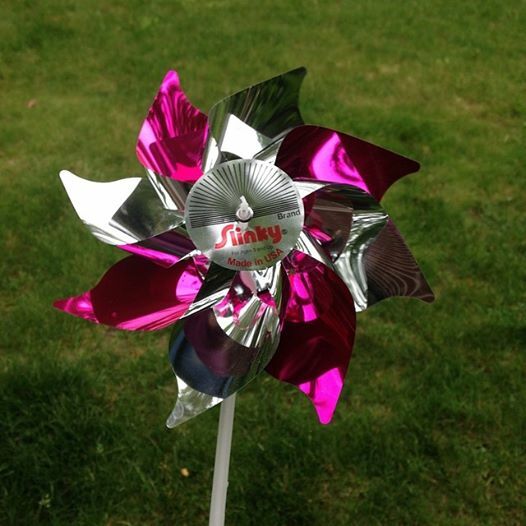 Pinwheels remind me of my Samantha. I missed her. All participants are invited to bring a pinwheel for each of the loved ones you will be honoring to line the finish area in addition to the poster. Yes, strollers are allowed in all races. We just ask that you line up at the back and the child stays in the stroller for the entire race for safety reasons. Yes, children need to be registered to participate in the walk and Kids K and the prices are the same. Kids will be awarded finish medals in the kids K only but need to be registered. They will be given a shirt & bib number. The kids K is not timed. 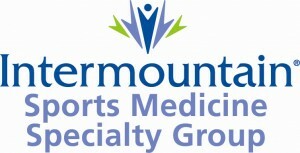 University of Utah Caring Connections (grief support group). To register for a grief group call 801-585-9522 or contact Shawna.rees@nurs.utah.edu.